Welcome to the 7th Annual World Bread Day, sponsored by Zorra Kochtopf. I love the thought of breaking bread together, and if not all together, then at least baking bread together globally. For my selection, I chose my favorite every day bread, Farmhouse bread, the recipe given to us and taught by Faith Brockoff during a class Auntie Miranda, Ann, and I took at War Eagle Mill for Auntie's birthday a few years ago. It's a wonderfully crusty, eggy, bread that's easily adaptable by using all-purpose white flour, white whole wheat flour, or a 50/50 mix of white and whole wheat. To decorate it, I simply took cake decorating colors and paint brushes from my cake decoating supplies and primitively painted on a deep red sunflower encircled by vines and leaves. I used the paste food coloring straight out of jars, occaisionally tipping my brush lightly into a small cup of water to thin it. I love the way the browning crust turned the colors from bright and shiny to a deeper, more antiqued look on the bread. And best of all, we have fresh warm bread to eat, slathered in real butter and sweet fall pumpkin butter, to devour with dinner. Doctor's Kitchen Monday: "There's Chicken in my Spaghetti"
Chicken, a simple substitution that has much less fat in it than beef in spaghetti, still has all the taste of meat and and the healthy goodness of the tomato sauce. A perfect dish for the crockpot, it's also easy to throw into a roaster to cook it low and slow while leaving it alone for the afternoon. I first had this at the soon-to-be in-laws of my friend, Shawna, 20-something years ago. I'd flown to Calgary to attend her wedding and we got snowed in, blizzarded in I should say, at her wonderful in-laws where we were served this for one of the dinners. Let's talk the weather in Canada for a second, shall we? I'm from Missouri, although I have lived in Washington (state) and Utah but that still didn't prepare me for Canadian "spring". The wedding was in April and I remember Shawna saying about clothes "wear whatever you would normally wear in spring". Hmmmm...what she meant to say was "wear whatever you'd wear for Missouri winter". Although we get a few snows over the winter, our snow is usually gone within a few days. I wasn't prepared for snow that stayed on the ground until almost summer and the freezing temps that accompany that snow. At the time I freaked out in my light sweaters and khakis but now I look back and smile and am warmed by the memories of spending time with my dear friend and the hospitality of her new family. This dish is my entry this week in Ruth's, of Once Upon a Feast, wonderful Presto Pasta Nights, hosted this week by Graziana of Erbe in Cucina . Be sure to drop by her "place" on Friday to see all the wonderful pasta dishes rounded up this week. In keeping with the goals I've mentioned before of dieting and reining things back in my life, I've been thinking I'm going to start posting more of my daily menus, of course hoping it will inspire me more and more to keep fighting the good fight when it comes to food. As in REAL food, not processed crap. Sure, there will be days when I eat out or drive through a "thru" or screw up (translation: soda!) but all in all I'm feeling pretty rejuvinated. It's amazing to me how many of our choices in life, bad choices in life, are made because we feel bad. Do you know what I mean? I'm finally, after months of respiratory infections and fighting my asthma, starting to feel like myself again. The odd thing to me is how much feeling better has perked me back up in terms of not only my attitude but in my food choices and what I'm physically able to do. I'm not "living" on sugar and caffeine anymore. Isn't it the ultimate irony that when the body feels crummy we tend to take the easiest way out and feed it crap from a box or a window when that's the most important time we should be concentrating on healthy, vibrant, nutritious foods? Crazy but human. It's just too easy these days to grab bad food when we feel bad and save cooking for when we feel better. Sad, but true. But hey, I'm back, and today I made my new favorite all day spaghetti sauce that's actually packed with, yes three meats, but also tons of fresh veggies and isn't overloaded with fat. This sauce is not your average hamburger and tomato sauce sauce. It has three meats: sirloin (chunks and ground), pork chops, and Italian sausage. It's finished out with five vegetables and a host of seasonings. Normally, I'm not a huge meat eater, not because I don't like the taste but because I don't like the texture. This one is different. From being simmered so long, the meat has the softer texture of a really good slow-cooked chili or vegetable beef soup. With about a 40 minute prep, if you can handle two pots at once, it's a great recipe to throw into the crockpot to finish simmering while you work during the day, or sleep to us nightshifters. This is my entry for this week's Presto Pasta Nights, created by the very cool Ruth of Once Upon a Feast, and hosted this week by Patsy of Family, Friends, and Food. Check out both blogs on Friday to see the round-up of great pasta dishes across the blogs this week. Thanks, Sara! I intend to have a lot of fun with these! 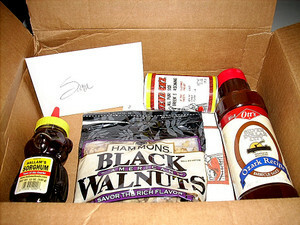 From my state, Missouri, I sent Sara MO black walnuts from Hammons (Stockton), Cavender's Seasoning (Harrison,AR), Silver Dollar City (Branson) BBQ sauce made by Ott's (Carthage), and Hallam's sorghum (Ozark). 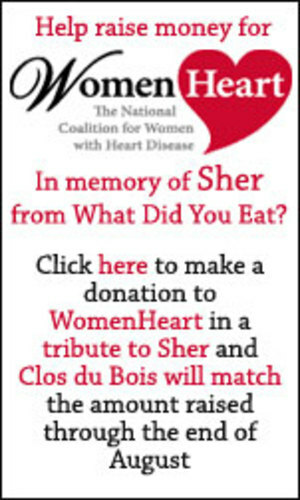 Lia Huber of Swirling Notions has hooked up with Clos Du Bois to initiate a wonderful tribute to our wonderful friend Sher Cermak of What Did you Eat? who passed away on July 20th recently of a massive heart attack. Clos Du Bois has agreed to match funds that we raise up to $10,000 which means we have the chance to raise up to $20,000 in Sher's name! To donate, please click here: Women Heart through Swirling Notions(not on the graphic to the left). My link will take you to Lia's posting where she explains step by step and has the links so that all donations we make are credited to Sherry and so that we can have an idea of the total donated. WomenHeart is the only patient-led national non-profit organization that educates and advocates for the 8 million American women living with heart disease. With 16,000 members and 50 local support groups, WomenHeart gives women heart patients and physicians a platform to spread the common message of early detection, accurate diagnosis and proper treatment so all women can lead healthier lives. Thanks, Lia! That's a wonderful idea! My Mail Blogging genie turned out to be Deborah of The Humble Housewife who lives and caters in Ireland. But get this: her husband is originally from my town--Springfield, Missouri. How freaking cool is that? By her choices, Deborah shows that we have lots in common! Baileys? Yum! A good paring knife and a small pastry brush--YES! Tea? Boy, howdy. Marmalade? My FAVORITE!!!! Candles? Love 'em. Chocolate? Hiding it from Gene. Shamrock cookie cutters? Deborah must have ESP because I almost bought some this year and then decided to not be frivolous. Grumpily frugal. Now I can enjoy them next year and not feel one bit guilty--thanks Deborah! How did you know? There is nothing like getting a present in the mail. It turns us all back into children with a pure joy of opening a surprise. As an adult, it's also the entryway into a special bonding among foodies. Isn't it nice to know there are "others" out there like us that share this passion? 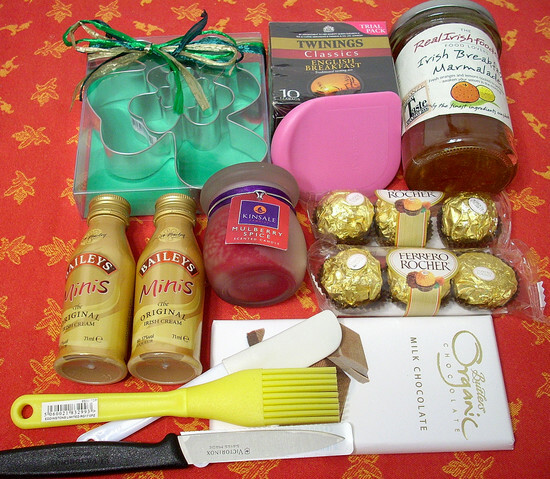 Thank you so much Deborah for both your goodies and your kindness! I'm now an avid reader of yours and a cheerleader in your corner on your catering business--best of luck. Evelin at Bounteous Bites is an adorable young woman who is 17-years-old and already an accomplished cook. I was so grateful to Stephanie for sending me her name. Her blog is so fun and impressive. I don't mean to hound on her age but I was blown away when I realized just how much experience she has under her belt. In a way I related to her. I, too, was in the kitchen at a young age so by the time I went to college I was sort of the "Mom" in the kitchen to my roommates. I noticed also, that like me, Evelin loves to bake and all of her desserts are beautifully done. 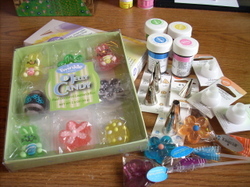 I thought she might enjoy a few of my favorite little things to cake decorate with so I put together a care package of Wilton pastry bags, couplers, tips, food colors, and then some fun candy jelly flowers and lollies. I can't wait to see what lovelies she makes with these new kitchen toys. Happy St. Pat's Day a little early! I'm working most of the weekend including Monday but I wanted to share this meal with you. Yum! St. Pat's food is one of my favorite go to for celebratory meals. Don't know why I don't prepare it more often. Actually, the Reuben is my all time favorite sandwich and corned beef hash and eggs is my favorite breakfast. 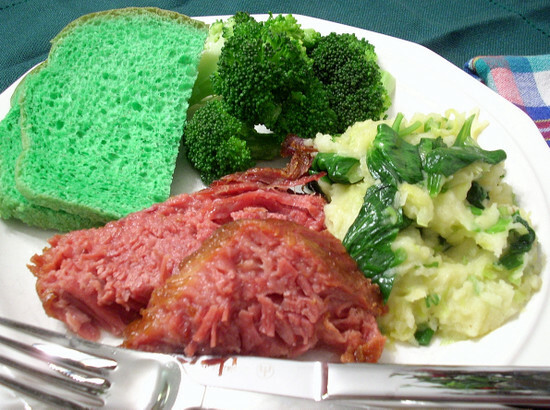 Can't go wrong with corned beef and cabbage in any form! By the way, the green bread is a joke. It's simply my standard white bread everyday recipe that I added green food paste coloring to for some St. Pat's silliness. As for the holiday itself, St. Patrick is credited with both driving the snakes and the pagans out of Ireland. As Ireland's patron saint, Patrick is attributed with using the abundant shamrock as a teaching tool to explain the three-in-one nature of the Trinity. This is my entry for this weeks' Weekend Herb Blogging, originally created by the lovely Kalyn of Kalyn's Kitchen. This week, WHB is hosted by Kel of the fabulously photographed Green Olive Tree. Check out all the other entries after Sunday evening. Cardamom is a spice, not technically an herb, but Kalyn's focus is on all herbs, spices, or plants. Cardamom, my favorite spice, is used quite a bit in northern European and Middle Eastern cuisines. 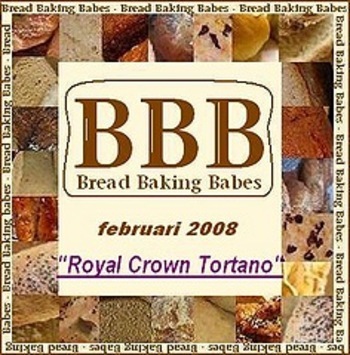 The second I opened the email invite to join Bread Baking Babes from Tanna, I knew I wanted in. The second she sent the first month's recipe and it had "Crown" and "Royal" in it, I knew I was in love. Okay, enough with the bad jokes. This bread was really fun, though long and complicated to make. I'm not saying it was hard, it was just different. The dough was different, wetter and sloppier, which hurled me out of my comfort zone but in the end I enjoyed those sweating moments of wonder and Gene and I both are enjoying the big round loaf of chewy, hearty bread with a wide spectrum size of bubbles in the crumb, and that chewy/crisp crust that made every hour and every turn worth it. This bread so inspired me that after baking it on an airebake metal pan, Gene and I went to Lowe's where I bought a couple of unglazed slate tiles to use for a baking stone and a couple more small ones to heat up for the bottom of bread baskets or to throw into a roaster to create steam for my next attempt. Cost? $1.88 per large tile and .99 cents per small tile. That works for me. You know what I had the most trouble with? The baking part. Actually, my crust color is much lighter than what this recipe called for but at the time it FELT so dark. I've told the story many times that I grew up in the kitchen of a cake decorator. I was my mom's apprentice, basically. In the cake frame of mind, overbaking is kin to a sin. I can still hear my mom's voice saying "White cake is supposed to be WHITE! Not BROWN!" So there's something embedded in me that has a hard time letting any crust get dark brown. Someday I'll get over it and allow myself to bake a bread to a deep dark golden browned crust. But I bet you I'll feel guilty the first time I do. 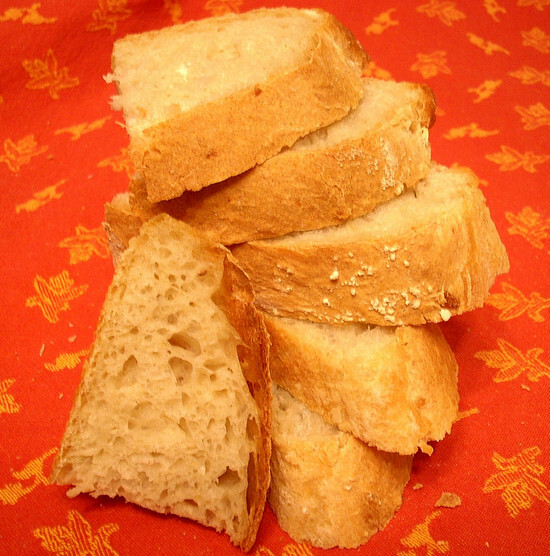 By the way, the flour I used made for marvelous-tasting bread. It's King Arthur European-style Artisan Flour, available (in this area--Springfield, MO) at The Cheddar Block on West Republic road between Kansas Expressway and the bridge that crosses over James River Expressway. I found this challenge to be just that: challenging. While I have an extensive background in baking cakes, tarts I'm not as familiar with so this was fun in a slightly stressful way, let me put it that way. I've never before made my own mousse or caramel. I've always wanted to do both but yesterday was a first for both. I learned a lot, mostly from my mistakes. But that's the whole point of being in the Daring Bakers group. I wanted the challenge of exploring new baking territory. 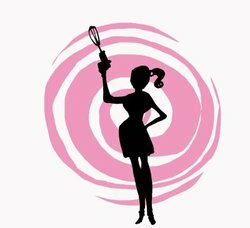 For a list of all the challengers, click on Daring Bakers for links. Not to continue complaining about my knees but I'm going to anyway. Still having problems with them. Still miserable at work (from my knees only) and had a doc appt yesterday about them. We're going to try a new painkiller that's non-narcotic, thank God, and maybe some joint fluid therapy. In the meantime, I admit, even though cooking is still relaxing for me, I have to be careful on my days off not to spend too much time standing or it makes it worse for work. This little project was four hours in the kitchen! 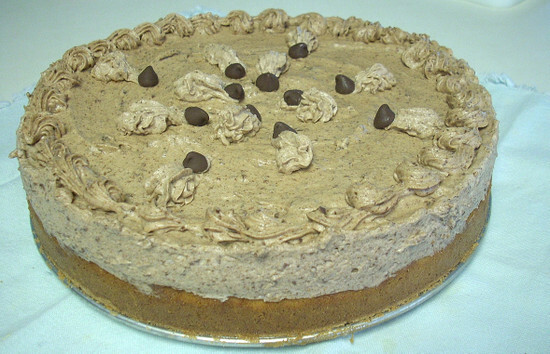 I'd put off making the tart until right at deadline time so there was no doing one little thing a day crap. It was a straight on onslaught with putting things that needed cooling into the freezer and cutting out all the middle man of time I could. Let me walk you through my experience with this little recipe. For one, the first thing it says is that the shortbread pastry will make three tarts. Well, I didn't need bulk, I needed ONE. But instead of dividing everything by three, since dividing two eggs into three parts, gets dicey, I divided everything in half and went from there. I think I ended up with a little too thick of shortbread crust but it's good and we'll survive the trauma of having a thicker crust, you know? I did make two alterations to the recipe. We're supposed to run the recipe as is but I had a couple of problems. For one, this really was a hit and run this time so it was one trip to one grocery store and one afternoon. 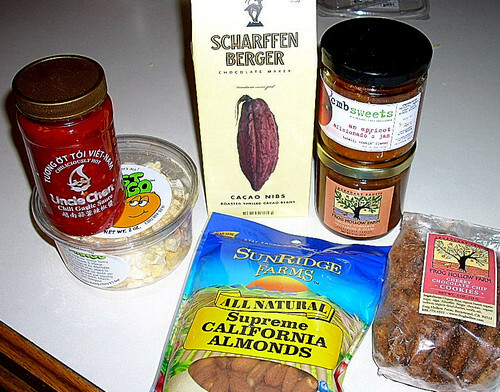 So when I couldn't fine the hazelnuts on my pass through the grocery store, I chose to read "hazelnuts" as "almonds". And I left the cinnamon out of the crust completely. My husband, Gene, hates cinnamon and since I'm counting on him to eat a goodly portion of this thing, it made no sense to alienate my audience from the beginning. Okay, for breakfast blogging I made the theme to be "Ethnic Dishes with a Twist", the twist being that everyone should make a breakfast recipe from another culture, country, or ethnicity than their own. Everybody else has been doing a great job with this event and I finally had time tonight to complete mine. I couldn't decide what to do at first. One of my ideas was to make congee just because I see it on the menu of every big city hotel we stay in where there's a high percentage of Asian tourists. Then I read a recipe and found that it's basically a rice porridge. That's fine. Actually, I love rice for breakfast with just a little butter and milk on it. I know that's not the same thing but somewhere along the line I lost my enthusiasm. My other idea was to look up into my own family tree. I'm Swedish/Norwegian on both sides but we have no Scandinavian hand-me down food traditions and that makes me a little sad. I decided to make my own. Ever since elementary school when I first heard of St. Lucia Day, I've been been wanting to wear lit candles in my hair. After all, I am the oldest girl of family. But amazingly, Mom and Dad weren't real hip on that whole fire on my head in the wee hours of the morning while I'm baking bread thing. I don't know why. But I'm an adult now so I can wear lit candles in my hair if I want to. The problem is that now that I'm adult the idea has lost its appeal. But not the thought of the St. Lucia buns. I don't have a lot of practice with saffron but I do use and love cardamom, my favorite Scandinavian spice. Put the two together and I call that Good Eats or Yumm-o or some other phrase that isn't already in the lexicon by people who might possibly sue me for using their trademark phrase. 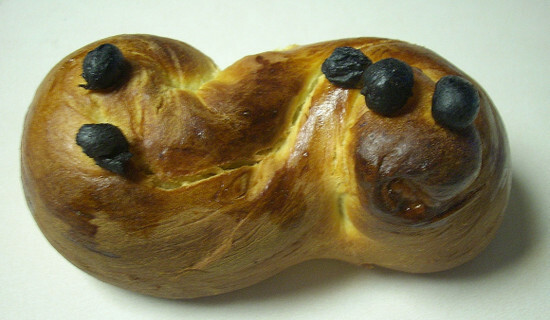 St. Lucia (Sankta Lucia) Day marks the beginning of the Christmas season on December 13th. Sure, I'm a little early but let's call this a practice run. The tradition is for the eldest daughter in the family to serve saffron buns to her family while wearing a white dress with red sash and a crown of candles. It's a romantic tradition if not particularly approved of by Smokey the Bear. 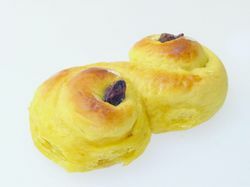 My saffron buns didn't come out exactly as I would have liked them. They're a little overdone but they still tasted good. Thankfully, Gene smelled them and pulled them out of the oven for me. You know that children's book "Alexander and the Terrible, Horrible, No Good, Very Bad Day"? Well that was my day yesterday. I made the lussekatter tonight to try to distract myself from the fact that I'm having big trouble with my knees (now both) again in the form of some very wicked fluid retention on both and pain going with it. But, I was able to get into my primary care doc today so hopefully he'll be able to figure it out and fix it. Quite a bit lighter than mine and without the weird plumped up black raisins. I have NO idea what that was all about but the buns still tasted good once we knocked the demonic looking raisins off so what the hell. We'll eat these up and next time, like December 13th, when I make them again, I'll be less distracted and pull them quicker from the oven.